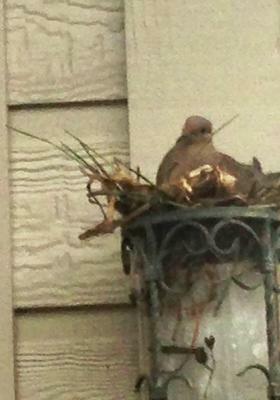 This is the second time we have had a morning dove sitting to nest on the ground around our front porch. It's been a few years in between, but I think it's Molly again. The last time I worried and would talk to her to say her housing choice was not the best. While we were away on work trips we ask neighbors to just keep an eye and drop some food in the area. Honestly the babies waited for us to get back before Molly let them fly off from the nest. It was quite something. They did come back by later in the spring too. Now this time she is under our weeping cherry sitting on two quarter size whitish eggs where I found her as I bent in to weed. She just scooted over a little and when I backed out she went back to sit on the eggs. We just hope we have the same outcome as last time since we leave tomorrow for a work trip and will not be back until Thursday. It is possible she started in the weeping cherry in a nest this time and the nest didn't hold, but it's so thick we can't see in there. My husband said the father will bring food, but how likely is she possibly a single mother? It's cold and rainy today and we hate to leave her there chilly on the ground sitting on the two eggs. Hope she is here on our return. 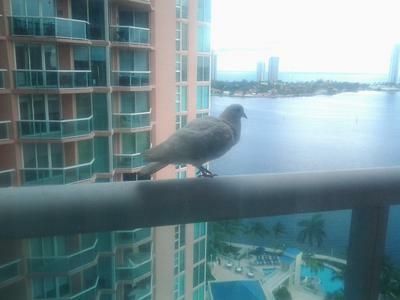 It was in the early October that I found two Doves were sitting on my window. When I would go near them they would fly. This continued for many days but after some days, they remained sitting on the window even being aware of my presence there. Perhaps they were coming there to survey as they had to build a nest. So they seemed to be searching for the right place for it. 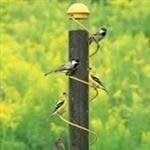 After some days, I found them building a nest on the electricity pole in front of my window. One Dove was fetching weeds and sticks and gave it to other dove which was trying to weave them to build the nest. 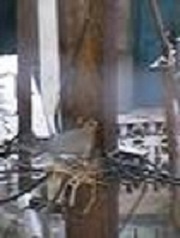 Next day, the Dove laid an egg, but their nest was not completed, so the egg slipped to the other side of the pole and was broken. Two months later, in January, they again came there to build a nest and this time, they used nylon string (china string used for flying kites) as main ingredient and some sticks and small grasses. The nest was perfectly built and the next day the female laid an egg. The second day, another egg was laid. They began incubation at that time. After 14 days, I found two young ones (squabs) sleeping on the nest. The Dove was sitting on it. I also saw how carefully it was sitting on the squabs, it was feeding them by its beak. 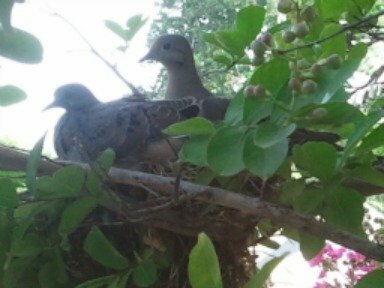 I have pics and videos where you can see that when one Dove comes, the other Dove which is sitting on nest flies away. They both exchange their places around 10:00 IST and 16:00 IST hours. We live on the 19th floor birds never fly in. 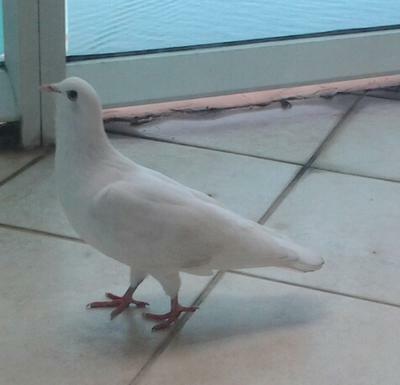 One day my roommate and I were talking and I see this BEAUTIFUL white dove. Amazed we just watched him thru the window. He kept coming back everyday. He would follow me from balcony to balcony. One day I was in the kitchen cooking I could see him and started recording him he flew right up to me he started cooing I was hooked. I stared putting pictures of him on Facebook and asked my friends what should I name him. Angel is his name. I work strange hours in retail and was not home much for the holidays but he always comes. I do feed him and give him freshwater but I was at another condo in our building and he came looking for me he heard my voice. 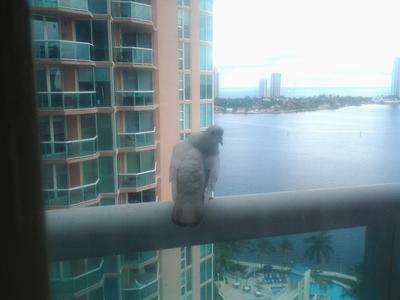 I went back to the 19th floor and watched him going everywhere looking for me as soon as he finds me he starts to coo. We could hear these doves for days it seemed but couldn't see anything. Then Penelope D. Drinxwell got involved. She's my 5 yr old black "classic tuxedo" indoor cat. We could see her take sudden and extreme interest right outside the living room window. The smallish evergreen in the corner surrounded by our window frame/wall and front door entrance) was obviously the new digs for The Dove Family. 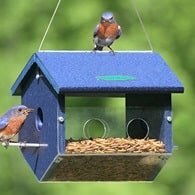 Once, one of them actually had the nerve to sit right on the window ledge (resting during the home-building process no doubt) with nothing to separate Penny and their innocent little heads but 1/16" of window screen mesh. Penny licked her chops, crouched low, even made envious low hissing sounds to alert us to the intruder right outside the house. She pawed the screen lightly with a few taps but that was all. 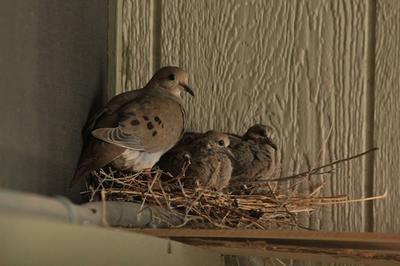 In a few days she accepted that the Dove Family was here to stay or at least until the kids were born and ready to go off to college! According to my calculations, the babies will appear around 5/15.... and by June---off to school. I see the father perched on the nest during the day, with no more coo-ing. Their condo's built, the eggs are laid, now they just need to keep quiet and incubate them. He doesn't move an inch as I walk by to get the mail, he looks like a Bird's Eye Frozen Food package. Sometimes he actually reads the paper. anyway, here's Penny first, soon I'll show the kids. I went outside this morning to have some coffee and noticed this little nest so cute got a stool and took a picture after I found the two eggs in it. After a little bit I went in and then came back out and found the mama just sitting there so still and quiet. 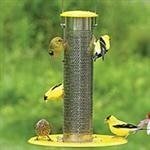 Put some bird food out there so it will feel more comfortable. I've never seen a dove out back or even around my house so I am so excited and hoping to get to witness some babies being hatched. The nest happens to be sitting on top of a ceramic candle holder that's right by my back door so guess the holder is out of order for now haha.. and having some babies soon. I have lived in Racine Wisconsin for almost four years now but have never had the pleasure of a close encounter with such an amazing beautiful creature as the Mornning Dove. I was blessed to have that encounter today! I have seen Mourning Doves fly through our apartment complex quite often and have had the pleasure of hearing their call too. However, I've never had the pleasure to view one up close as you will see from the picture I took on May 7, 2012. 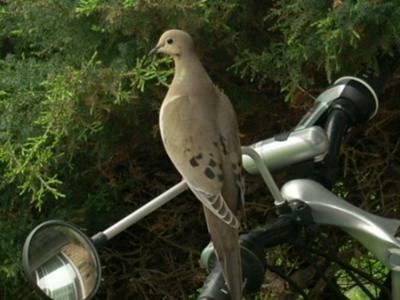 As Spring has given us the pleasure of such birds as the Cardinal, Mourning Doves, and quite thick Robins, I noticed one Mourning Dove liked to perch itself on our bicycle handle parked on our patio. It came back quite often and seemed to like perching itself there. We have a big bush in front of the bicycle where I noticed it also liked to ruffle it's feathers in. As Spring progressed, the more I started seeing this lovely creature. Everyday she would come back and perch itself on that bike handle. Today, I had come back from taking a stroll. As I was walking closer to our patio I noticed her sitting on the bike handles pretty as a picture! I walked ever so slowly closer to the bird and even told it how beautiful it was. It just perched there as if it knew what I was saying and returning the favor by letting me admire its beauty. I wondered if I could walk slowly into the house and have enough time to grab my camera. So I did, and the dove never even flinched an inch as I got six amazing photos from only a foot away from it! It was an amazing experience, one I will never forget. It was like looking at the hand of God himself. I thought maybe since I was so close to it, she would let me touch it's feathers but she didn't and flew to our apple tree. Needless to say, I picked the best one and placed it on my desktop to admire every day as I start my computer. 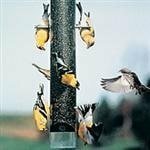 This year is the beginning of my birdwatching journey and I have been trying to create a bird haven in my backyard. 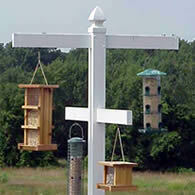 I have purchased a few feeders and birdbaths and have planted vegetation to entice them to spend time in my area. 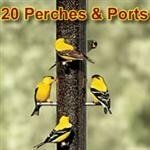 My husband even bought me a Oklahoma bird guide book. 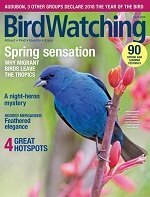 I have been having a great time trying to identify all the different birds I see and what their habits are. A few weeks ago I walked out my front door and was admiring the new blooms on my Crepe Mrytle tree. (Yes, I know they are usually shrubs, but ours was pruned to grow into a tree of approximately 14 feet tall) I looked up, and to my surprise, there was a mourning dove perched in a nest. I called my hubby out to look at it. He was amazed that it had made a nest so close to the front door. The nest looked so flimsy that I was nervous that a good Oklahoma wind would blow it right out of the branches. This peaked my curiosity so onto the internet I went. So much information.....I found out that they only lay two eggs in a brood and the young leaves the nest after 12-14 days. WOW!! Seems like such a short time with mom and dad. We have been watching the nest for the last 10 days. Today when I walked outside there was evidence of birds overhead by way of bird droppings all over the sidewalk below the nest. I looked up and there they were, the adult and the two babies. I worried that maybe they might get spooked as I swept off the walk but they never flinched. The nest is only about eight feet off the ground. I decided to push my luck. Since the nest was above my head, I pulled a patio chair over closer to get a better look. They were too cute to pass up a picture. I was able to get about three feet away from them and they never moved. Above is a picture I took with my phone. 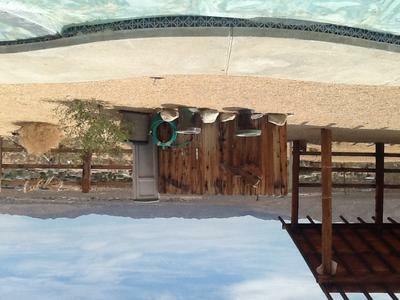 Starting in March 2012, my husband and I were thrilled to become part of a strange and wonderful new world. 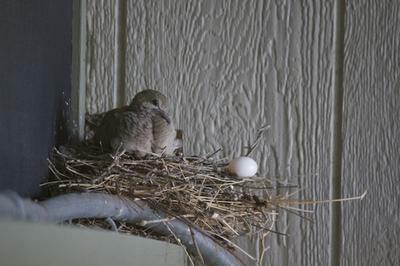 Mourning Doves built a nest in our carport directly across from our kitchen window. We had no idea how much we would learn from them and what great companions they would be. After six successful little families (12 babies) were launched into the world we were very hopeful that they would come back in March 2013. We were thrilled to see a new couple take over the old nest. The parents nurtured two little baby Doves to maturity and spent two days trying to launch them into the world. The hysterical problem with this little twosome was – they wouldn't leave the nest. They looked through our kitchen window and sat on our porch and posed for pictures, but they would not fly away. As is typical, we immediately had a new couple nesting. The unexpected problem they had is the two “old” babies wouldn't get out of the nest. The new father-to-be spent the day keeping the two old babies at bay. He finally gave up and the new, nesting Mom snuggled with two large baby birds in the nest with her. In fact, all four of them sat on the nest until the "old babies" finally took flight. The result was the birth of one, not two, baby doves. The unhatched egg sat precariously on the nest until the new baby flew away. Our nest is always full during mating season. We feed them sunflower seeds in a feeder on the ground and we have doves all the time. We also enjoyed having a pair of Doves in a hanging basket on our front porch this past May. Unfortunately I think the pair may have realized space was a problem when the two babies got to be about ten days old. They were practically on top of each other so they would not fall out. They fledged on day 14. Mom and Dad relocated to a bigger hanging basket across the street and raised two more. Mom and Dad would let us water the plant and not even fly out. I did get some nice photos of them, maybe I should share. I started noticing twigs all over in a corner above our front door. I kept sweeping them away only to discover more the next day. Why I looked up I don't know, but there sat a beautiful dove. So my husband and I started watching. Checked out the internet on their habits. Watched for the babies. Low and behold one day I noticed a couple of little heads. Soon they started getting larger until one day I just stood there and one flew away. I was saddened to think the one was left by itself, not for long. Probably the next day the other flew off. So before long, here they came again. Going through the same ritual. 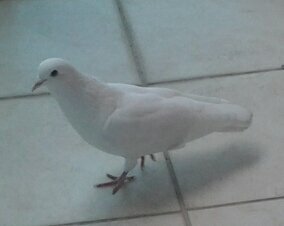 Today 2 little doves are getting ready to fly away. I am not a bird watcher but this has been a beautiful experience. 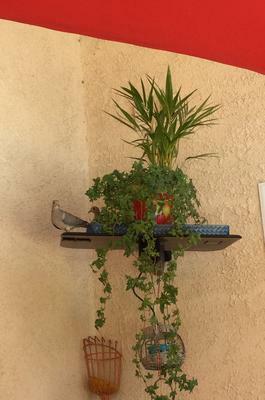 The parents built a nest on my small patio in a flowerpot on a top shelf of my plant stand. There were snapdragons in half of the pot but room for the nest. On the shelf above was an ivy plant that hung down and offered some protection from rainy weather. At first I only noticed one egg and then there must have been two. After a couple weeks I had two baby doves but one of the parents was always sitting and protecting the babies. It seemed it took forever before they tried to leave the nest. The mother and father would be on the ground, both cooing to their babies, I guess hoping they would leave the nest. They finally did, but the next day the two babies and mother were back in the nest. Next day, they left again and I cleaned out the flowerpot. 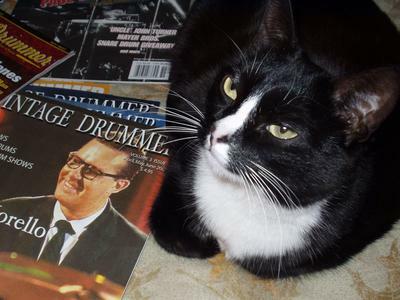 Later that day I saw one of the young ones sitting on another small flowerpot on the shelf. The next day the two little birds were sitting near each other on my glider. This continued for another day or two and the two little ones were always in a flower bed next to my patio. The two babies were back this morning in the flower bed but I haven't seen them after that. They have been so much fun to watch. Momma and Poppa were great parents...very attentive and caring. Over the last few days I have heard a bird cooing from 5.30, then again half hour later then the same again, I stood outside to see what it was and I can see a hole in the eaves of my roof just above my bedroom window, from here I have seen 2 doves sitting and cooing, could they be nesting there? At first I thought it was wood pigeons but after seeing the birds and checking online they are definatley doves. What adorable little faces looking down on you. Great picture! 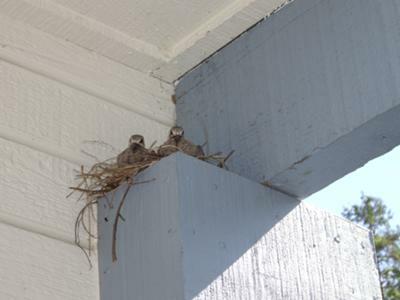 I hope they always find the nest on your porch a safe and welcoming place to start their life's journey. The second set of babies left the nest today but not too far. They flew to the next level to the right of the nest and sat all day. One actually went back to the nest as if to say "I'm not ready". Later in the afternoon my wife and I went to check on them and they had moved on. Now we will wait patiently for the next set (hopefully). Enjoyed your story--it's great to have dove visitors. 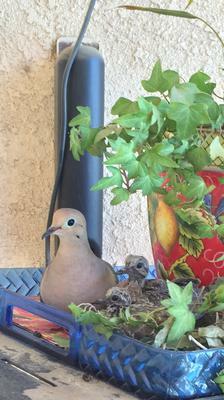 I thought I didn't want more doves on my porch, because last year I had TWO sets of babies born, and the planter was a different one, which was in the corner of my porch. So this year, I got another smaller planter, and put just a few artificial flowers around the edge, and hung in towards the front of the porch, still under an eave so they would stay dry. 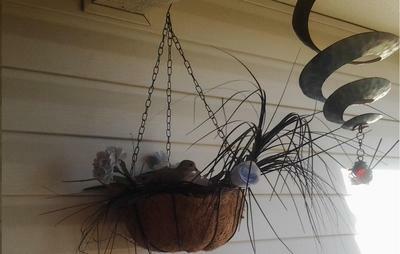 Sure enough, I noticed a bird flying away every time I opened the front door, and a nest slowly coming in there on top of the hanging moss, which was inside. After a while, when you open the door, since it IS farther away from the door, she just calmly sits! It will be easier to clean up there as well. 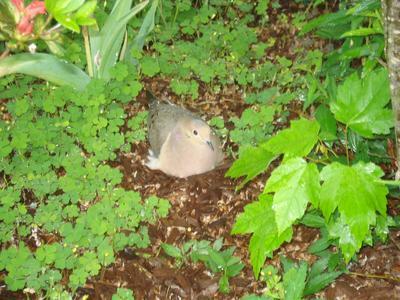 I am attaching a photo of the little young dove in the nest. It's really sunny out today, so she looks like she's in the shade a lot, but she isn't. I hope I get to see the little babies. I might have to be moving this summer, the house that I live in is owned by family, and we have all struggled to hold onto it, even after a couple of us lost jobs and some of us who couldn't find another. We even got on a government plan to "save your house"...but it was too little, too late. I will miss this house if we have to leave, so this is kind of bittersweet, watching a little dove bring some new life into this world, while we might be leaving this life we have known for nine years now. A lovely story and best of luck to you and yours. We have doves that are here daily for long periods of time but I don't know where they nest. I hope to see your baby doves and hope that you find a nice nesting place of your own. Every morning, I awake to the loud noises of my neighbor. Often it is nice to hear, but at seven in the morning it can also be described as annoying. 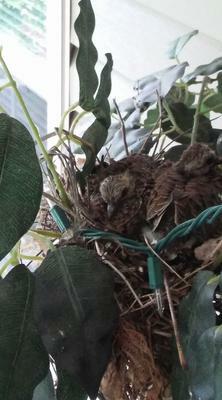 Annually, I share a window in my room with a dove couple and their hatchlings. 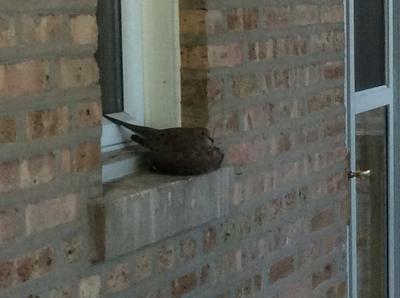 Because I have no screen in my window, I suppose it is seen as an ideal nesting place. 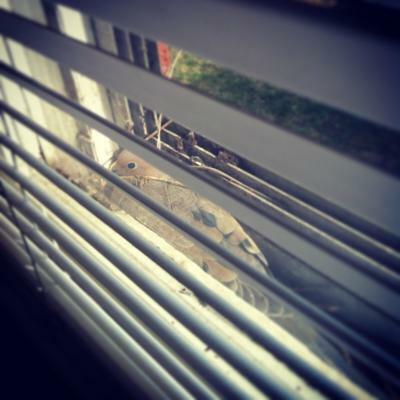 Yesterday, I had two doves "move into" my window. They both have carried twigs to loosely make a nest. My window is about five feet from the ground and has a decent amount of space. Currently, I'm listening to the territorial calls of the male dove: cooOO-coo-coo-coo. I absolutely love it. Although its very mournful, there's something oddly peaceful about it. Occasionally, I hear their feet clatter about the metal of my window. I do my best not to disturb them; only going into my room when necessary. Though, I quietly observe them through my partially closed blinds. Each year, I see at least two white eggs. 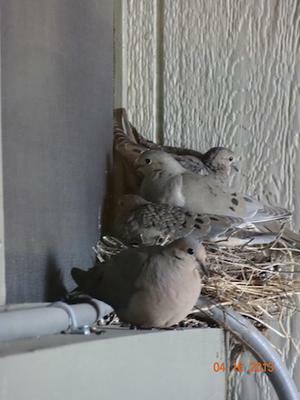 Last year, I had two pairs of doves inhabit the same nest in my window; one in the spring and one in the early summer. It is very much a treat to see the baby birds newly hatched, though I have, unfortunately, never seen a egg hatch yet. This year, I am considering scattering some bird seed nearby the nesting area on the ground. Knowing I can provide shelter to such a lovely creature fills me with excitement and curiosity. I do what I can to help these birds successfully raise their hatchlings without trouble. Each year, I look forward to seeing a new neighbor. I love your story. You are so kind. 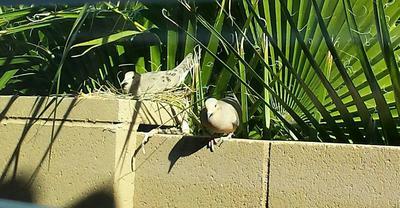 I have doves that hang out in my back yard. When looking out my den window I am just a few feet from them. They are a joy to watch but I must say I a glad I have a screen on my window. Thanks for sharing your story. It makes me wonder if I could build my doves a nesting place. What a wonderful story and thanks for sharing. As I sit here at my computer I too hear our Doves cooing out in our backyard. A pair built a nice nest in one of our pine trees last year and think they are planning on raising their young there again this year. 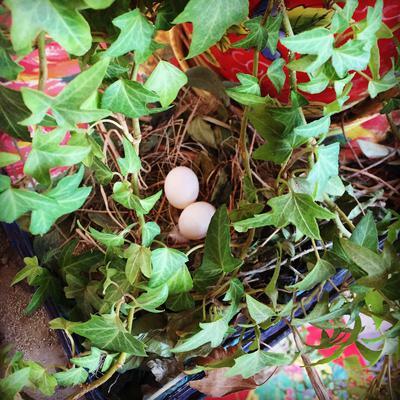 Last summer doves visited my plant stand, laid their two eggs that never hatched. This year they are back and just had a successful clutch of two birds that hatched, survived and flew away! I felt like a proud caretaker. Last year the parents didn't lay on the eggs 100% of the time, I noticed a big difference this year with the successful babies, the parents were on the eggs most of the time. This week, only a few days (4-6) after the babies left, the next brood is on its way. 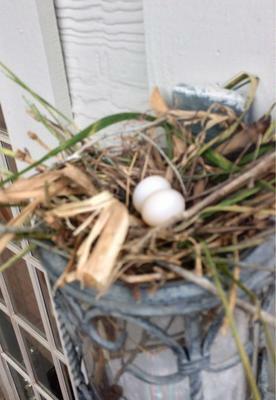 I noticed the doves building the nest again earlier today and this evening the first egg was laid. Pretty exciting to be hosting my own little dove sanctuary! Hi I don't know much about doves just think it's crazy where this dove decided to make her nest. One day I saw her building it on my patio shelf where I usually keep my outside gardening stuff. She left and didn't see her come back until one day I walked out I saw two doves sitting there. I laughed and said, so they got caught huh? Both doves just looked at me I said, so this is where the action took place. 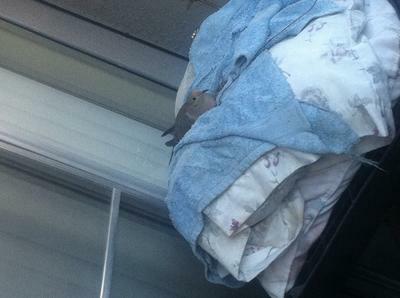 I said to the doves because I had 2 pillows laying on top of a shelf where they were sitting. Sure enough, she stayed there and has been there waiting on her arrival. So I googled about doves to learn what they eat and there habits. That's how I found this website. Thought I'd share my thoughts. We have lived in the Hi Desert of southern California for just over 3 years surrounded by quail, mourning doves, roadrunners, hummingbirds and a wide variety of other wildlife. The first couple of years we lived here, we fed all of them until the pigeons started joining in. When we reached 65 pigeons, we stopped feeding but provide fresh water at least twice daily, more often as needed. For the last several weeks, the mourning doves have begun congregating by our pool, far away from their other water sources and former feeding area. We put a green concrete bird bath in the area which they all loved. 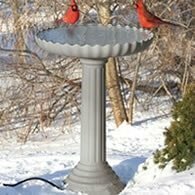 As more doves arrived, we added a second birdbath which is identical to the first one except it is brown instead of green. We have to use concrete because of wind. The doves do not use the brown birdbath. No matter how many there are, up to dozens, they only use the green one. We bought both of them at the same time from the same vendor and have cleaned them both in the same manner since we have had them. Yesterday we switched the tops (see photo) to see if it made any difference. They still prefer the green bowl. Several are just staring at the bowls now while looking very confused. I guess we should switch them back? We work on oil well site in Huntington Beach, Ca We have Palm Trees here and the morning Doves were nesting in them. 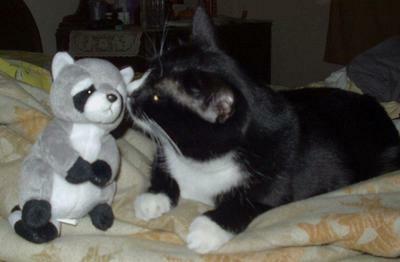 One has taking a liking to humans and hangs with all of us every day. 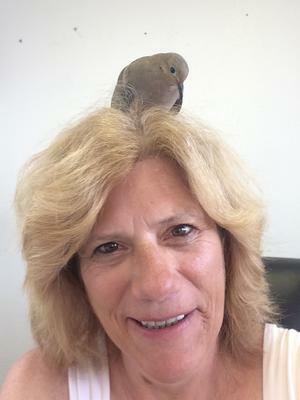 She will fly in the office, when the door is open, and hang on your desk or your head for awhile. She will follow all of us employees around the yard and make your day a lot brighter because she is in it. We all here have adopted her and she us, we feed her now and watch over her. It has been amazing how a little bird can brighten up my day like nothing else. I enjoy her welcoming me and the other employees at work with her sitting on our chair, or head, or computer or the like. 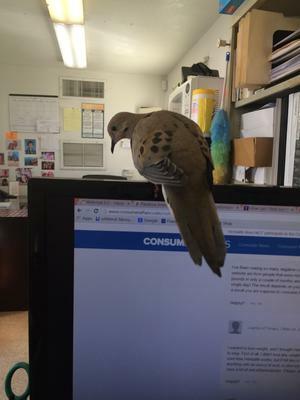 The pictures I have attached is of Birdie that we all call her on my head and one on my computer. It's nice we can watch them from our dining room window, the wall is about 5 feet from the house on the North side. The nest gets the morning sun from the East. You should never move a nest as it is interpreted as a predator attack. It's also illegal if it's an active nest with eggs or young. 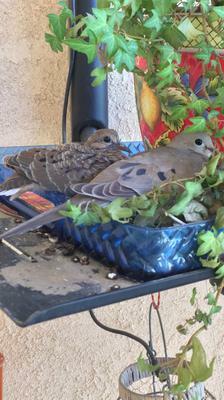 This is our first year with Mourning Doves. They built a nest in an artificial tree that we light with white lights to give a festive appearance to our back deck. 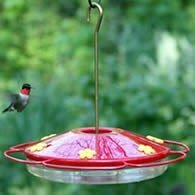 However, since they have been out here, we haven't been able to use our deck as they panic and fly away whenever we go out there. Mom and Dad Dove have had two rounds of hatchlings so far this year. The first nest had two eggs. One afternoon, I was outdoors and returned home when the winds began blowing heavily. I looked out to the deck and saw that the dove tree had blown over in the wind. I immediately reached out (without touching the nest) and stood it upright and secured it with chairs to hold it firmly. Sadly, one of the eggs had fallen out of the nest onto the floor of the deck and cracked. :( The other hatchling was okay. After several weeks, mom and dad took off for several days. I kept an eye on the baby and it seemed to be motionless. Around the third day alone, the baby hatchling was gone. Not sure if it had flown or taken by a hawk. We have a lot of birds out here. Mom and Dad got busy quickly after the baby was gone. They were literally making out on my back porch, literally kissing for hours. Next thing we knew, mom was back to nesting again. Soon after, two eggs appeared and now the second set of babies are in the nest. Mom and dad take turns watching over the nest. They are amazing to watch.